Poison glands in the skin of the caterpillar prepare a potent toxin delivered by uriticating hairs. To sting a stinger: Saddleback caterpillar, Acharia stimulae, and brachonid wasp, Cotesia sp. A first encounter with the saddleback caterpillar is usually a memorable one, more likely to be experienced through the sense of touch rather than the sense of sight. Protecting the front and rear flanks of the garishly beautiful caterpillar are projections festooned with nasty spines. These spines, or urticating hairs in entomological lingo, contain toxins released upon contact with a would-be predator or unobservant human. The toxins cause a mild to severe burning sensation reminiscent of a wasp’s sting. In some cases, a very uncomfortable and persistent rash may develop at the point of contact. to ride a horse. 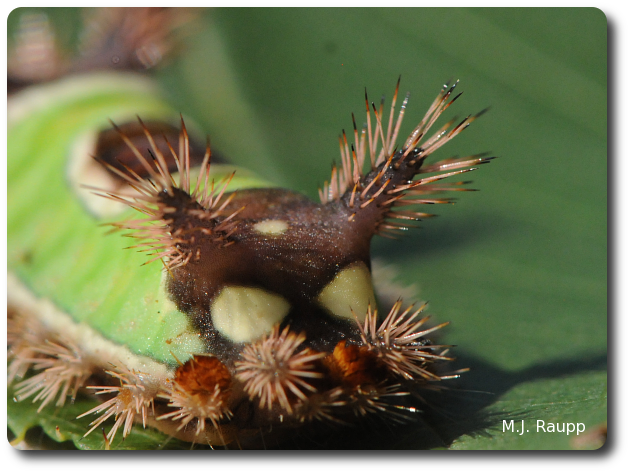 Saddleback caterpillars eat a wide variety of plants in the forest and garden including oaks, elms, lindens, apples, plums, corn, blueberries, and grapes. While mowing one day, I received a memorable sting on my ankle from a saddleback dining on small violets in my lawn. With such a potent defense, one might think the saddleback has gained immunity from attack by enemies. Unfortunately, for the saddleback, this is not the case. Last week, I received a saddleback festooned with tiny white objects on its back. Gardeners have likely seen small white objects like these on the back of hornworms on tomatoes and identified them as eggs of some mysterious enemy of the caterpillar. 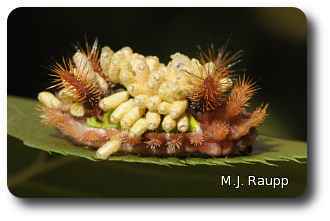 Dozens of wasp cocoons adorn the back of this saddleback caterpillar. In reality, these are cocoons of small parasitic wasps in the genus Cotesia. Female Cotesia wasps hunt saddlebacks and other caterpillars in the foliage of plants. Upon encountering a suitable host, they jump aboard and rapidly deliver many stings of their own using an ovipositor much like the one used by leucospid wasps we met in a previous episode of Bug of the Week. However, to survive successfully, the tiny wasp larva must avoid death by the caterpillar’s vigilant immune system. This is where a little help from mother comes along. In addition to depositing eggs, mother injects a special virus known as a polydnavirus into the caterpillar. The polydnavirus disables the caterpillar’s immune system paving the way for her young to develop without interference. Once development is complete, wasp larvae move to the surface of the caterpillar, burrow through its skin, and spin a cocoon on the exterior of their host. After a few days in the laboratory, dozens of parasitic wasps emerged from my hapless saddleback and immediately attacked other saddleback caterpillars nearby. Stinging and being stung, part of the circle of life in a bug’s world. We thank Ellery Krause and Dan Gruner for bearing the stings of caterpillars and capturing the wasps that inspired this week’s episode of Bug of the Week. The wonderful textbook “Medical and Veterinary Entomology” by Gary Mullen and Lance Durden, and fascinating article “Effects of the polydnavirus of Cotesia congregata on the immune system and development of non-habitual hosts of the parasitoid" by N. Lovallo, B. A. McPheron, and D. L. Cox-Foster were used as references for this episode. To learn more about saddlebacks and other stinging caterpillars, please visit the following web sites.